What Units are Available for Each Stage of Evidence Protection? Air Science protects the integrity of the forensics process from the crime scene to the crime lab. Each point of contact throughout the chain of custody swells with ample opportunity for contamination. Therefore, equipment that provides control and sterility is imperative for accurate results. Evidence that enters the chain of custody moves through, essentially, three different operations before its purpose has been achieved. Air Science has developed equipment and units to allow for optimal accuracy and safety throughout each stage of evidence processing. The first operation, collection & transportation, often can experience the most error as field tools or equipment may not provide complete control and sterility. 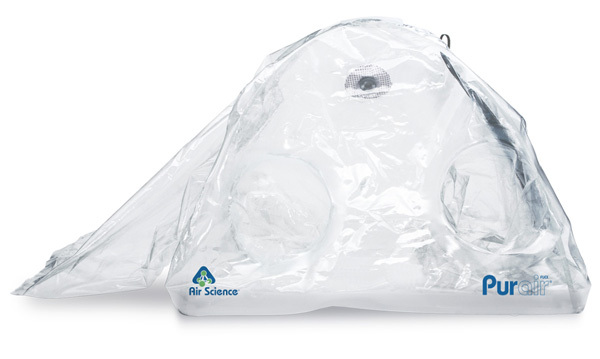 Air Science offers two products, designed specifically for the protection of evidence collection and transportation. Purair® Flex - A portable evidence inspection isolator with a curved flexible structure, this glove bag provides more working volume than any other of its kind. It's easy-to-use features and optimal safety measures make this a field unit every forensics department needs. Evidence Transporter - This highly mobile evidence transporter provides controlled transport from the field to the laboratory, while allowing effective air-drying prior to evidence processing. Easy to use and clean, your evidence will be well handled throughout transport. After field collection, evidence does not always go directly to the processing bench for analysis. Oftentimes, the evidence must be stored until time allows for processing or it must be dried for proper analyzation. Storage units become essential during this stage of the chain of custody. These two Air Science products offer the ability to store evidence both before and after processing. Safekeeper - These storage cabinets also act as optimally controlled drying cabinets, making them ideal for DNA evidence that must be dried before processing. With mobile capabilities and ductless air filtration, these storage cabinets fit seamlessly into any laboratory. Drugkeeper - Ideal for illegal substance storage, these storage cabinets protect the lab and the environment from hazardous chemicals and substances typically associated with drug investigations. In past decades, there has certainly been a welcome increase in care within laboratory evidence processing; however, many forensics labs still use inefficient methods for lack of space or resources. Safefume and Safefume 360 - These fuming chambers safely develop latent fingerprints using ethyl cyanoacrylate (CNA) vapor where moisture and fuming time are critical factors. The Safefume 360 offers high visibility access for development of latent prints from non-porous surfaces. Safedevelop - These fingerprint development chambers are designed to safely develop latent fingerprints on porous surfaces using DFO, Ninhydrin, and other chemicals in a controlled environment. 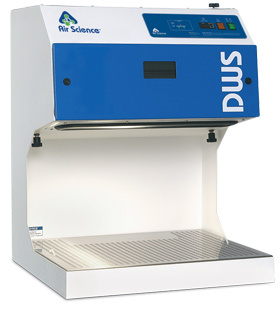 DWS Powder Workstations - these fingerprint powder workstations are ductless fume hoods designed to protect the user and the environment from hazardous particles generated from print analysis. Unrestricted front and side access permits intensive operator involvement, while downward airflow in the chamber protects the operator. 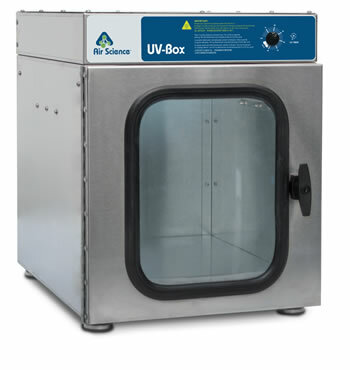 UV Box - These high-efficiency chambers are designed for safe and fast DNA decontamination, using high intensity UVC radiation, leaving evidence free of contamination prior to other forensic tests, analysis or procedures. Evidence Bench - With ample work space for processing evidence, the Air Science Evidence Bench includes an optional drop-in airflow pod for use with powder or chemical processing. Purair PCR - a sterile clean bench that uses laminar flow, these units are ideal for PCR amplification handlings that are extremely sensitive to contamination. 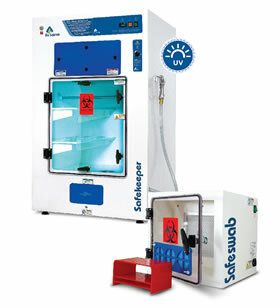 Features include easy UV decontamination and sterilization cycles. Purair BIO - Class II Biological Safety Cabinets designed for handling evidentiary samples such as bone, liquid blood, and tissue when processed in the preparation laboratory. Purair Basic and Purair Advanced - These chemical processing workstations with advanced carbon filtration technology protect the user and the environment from hazardous vapors developed during evidence processing. needed to ensure accurate, repeatable results for your important life's work.